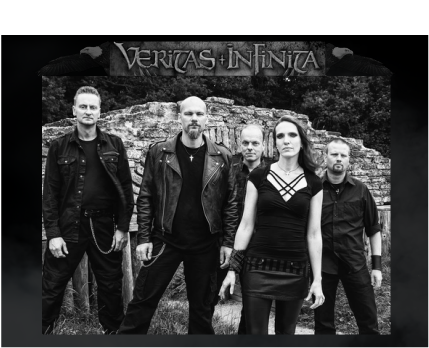 Veritas Infinita hails from Northern Holland, Netherlands and formed back in 2007 by Drummer Siebolt Brug and Guitarist Tjeerd Hiemstra.The band delivers up some Symphonic Folk Metal in the veins of bands like Within Temptation, HB, and Nightwish. Veritas Infinita means "Infinite Truth"and is based on two passages in the Bible-John 1:1-5 & John 14:6 "Jesus said I am the Way and the Truth and the Life, no one comes to the Father except through me." In late 2007 through 2008 the band was in its development stages and they were considering being a Heavy Metal band with the female vocalist that they had at that time. At the time of all this change the band was going by the band name 'Silence Falls' . Then came alone keyboardist Tjerk Bij de Leij who joined the band and helped to move the band in a Symphonic direction. In 2009 Linda Augustinus joined with her beautiful voice with a delivery similar to the vocalist of the aforementioned bands helping to solidify the band's new symphonic direction. "It is very important for us to make music with a message. Music with a deeper meaning. The red line in our lyrics and music is the message of Jesus Christ. With this we want to explain what the purpose in life is; Why a lifetime with Jesus is worth so much and what it means to know Him. We want to bring Light in the darkness and hope to a lost and dark world. The key to this Light and hope is a living relationship with Jesus Christ. We also want to be an inspiration to those who work and battle for His Kingdom. We may not always talk about it on stage, but God and His Word are in the center of what we do ... As a lamp unto our feet and a guide in our lives." 'Wondrous Ways' is a 5-track EP debut release that was recorded back in 2010 by'Veritas Infinita'. However, in 2011 to the bands dismay, just as things were starting to roll, Guitarist Tjeerd Hiemstra left the band resulting in an empty space in the Guitar department so Linda added her abilities on the acoustic guitar to help fill the gap. This album finds this Dutch band establishing themselves as a Sumphonic Metal band leaning more to the heavier side of Metal with some very good guitar work . Listening to a couple of the tracks, it seems to be a solid EP release for a debut which comes with some nice album artwork. In the year 2013, Veritas Infinita began work on some new material for their sophomore album. The new album was finished in 2014 and features Symphonic metal with pounding drums including the Cajón infused with heavy bass grooves and Ulliean Pipes, Irish Whistles, and the beautiful voice of singer Linda Augustinus. At this point you might be questioning as to what exactly is Symphonic Folk Metal? First off, Symphonic Metal is Metal music that incorporates sounds or instruments common with 'Classical Symphony Orchestras' for example, incorporating Cellos, Violins, Flutes, Trumpets, etc. it may also include touches of Operatic Vocals. In most cases these extra "Symphonic" touches give the band's music more of an 'Epic' overall sound. As for the 'Folk' Metal part of the genre description, this comes from the bands use of European instruments from their home land like the Ulliean Pipes, Flutes, Irish Whistles, and the other unique sounds that are common to the Netherland folks. I hope that on future releases we hear even more of these 'Folk' touches because they really help to distinguish this band from others giving them a unique sound. The way that I came across 'Veritas Infinita' is that here recently I did a large search for christian Folk Metal bands with clean vocals but only found Folk UnBlack Metal bands and there's only a hand full of those. The problem is that Folk UnBlack Metal bands sing with extreme vocals and I can't understand a thing that they are trying to relay so my search came up empty. Here recently, to my delight, after scouring the Christian Metal Realm on a general search, I came across the band 'Veritas Infinita' who just fell into my lap so to speak. After listening to the band for the first time, the Folk Metal touches with the clean vocals is what got my attention. (For more info on Genres see: Genre Defs). Vocalist Linda Augustinus has a beautiful voice as she sings with a slight Dutch accent. I like the parts when the songs tempo is moving along and then the tempo picks up and Linda's tempo picks up as well moving the song forward and adding variation to the listening experience. Linda does a great job on this release and the only suggestion I can make is that on future releases to add a few areas with some stronger vocal deliveries to add even more variation to the album. I believe that with the confidence that she has gained off the previous two albums that we are going to only see greater things to come from Linda Augustinus. The guitar work of Thomas Elzinga shreds as it goes from Thrash like riffs to general 90's noodling. Thomas does a good job with the simple Thrash riffs that add epic atmosphere to the songs. Thomas Elzinga also handles Bass here and lays down some heavy Bass lines that stand out as they hit hard like thunderous rumbles. Tjerk Bij de Leij does a nice job on the Keys producing the Symphonic sounds which are not overly done and adds just the right touch of atmosphere to each tune. Drummer Siebolt vd Brug does a nice job keeping time with plenty of variation. He also plays the Cajón which is a box drum that's played by hand. Siebolt helps to add an Epic feel to the music with his play on this instrument. Apparently, everyone was wondering weather the band was going to cease or move forward after the release of this album because the lead singer and bassist decided to step down. However, the band has announced that they have already began auditioning replacements and have no plans of slowing down. "Great news, Veritas Infinita is as good as complete again! Yesterday we decided to go further with singer Rianne van Dijk! The occupation of our band is now as follows; Siebolt van der Brug (drums) Jan Kool (bass) Tjerk bij de Leij (keys) Alfred Broers (guitar) Tjeerd Hiemstra (guitar) Meinder (grunt) and there will soon be another singer on audition because we want a broad sound!" If you like bands in the Symphonic genre but are looking for one that is a little different having Folk Metal touches then your in good hands with Veritas Infinita. "The cross behind the name stands for the place that Jesus died for us to give eternal life. A symbol of victory over death and the way to the Father. This refers to the bible verse John 14:6. The three Ichtusfish in a circle are refering to the trinity; Father, Son and Spirit."